I haven’t cooked in awhile (I’m a lazy vegan, remember?) but I had a serious craving for kare kare last week. I think it was triggered by seeing the beginnings of my Dad’s garden this summer, particularly the eggplant. I’m so spoiled by the garden! Alas, there are no veggies yet. Thank goodness for grocery stores. 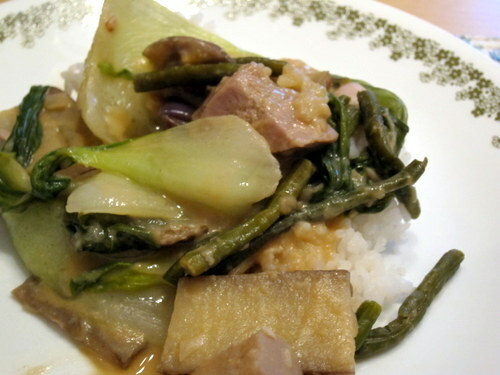 I previously made kare kare using soy curls and it was good, but I wanted to try something different this time. I didn’t want to drop a meat substitute altogether even though all-veggie kare kare would be satisfactory. I didn’t want to use tofu. I didn’t want to use mushrooms. I didn’t want to use squash. So I used jackfruit — young, unripe jackfruit. 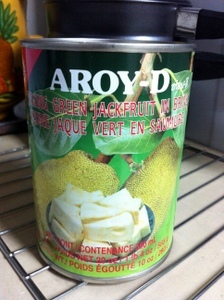 You can find canned young green jackfruit at any Asian grocery store. Make sure you get the jackfruit in brine, not syrup! 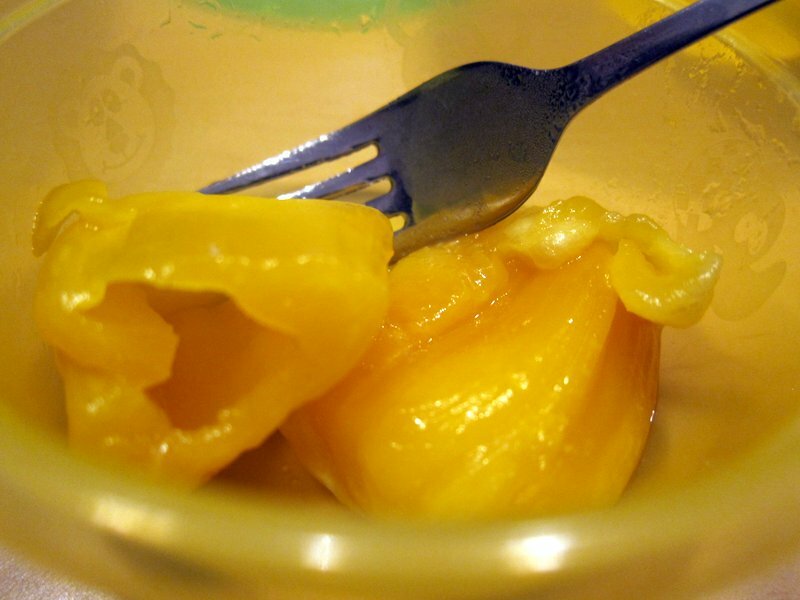 It’s not to be confused with ripe yellow jackfruit, which is sweet (and delicious in halo halo… yum). I’ve seen unripe jackfruit used in savory dishes. Luminous Vegans has a great BBQ Jackfruit recipe that’s like a vegan pulled pork sandwich. My Mom adds it to dishes. There is a plethora of vegan Jackfruit ‘Carnitas’ Taco recipes on the Internet. With the shred-like texture of the jackfruit, some imagination and an open mind, the possibilities are endless. Kare kare always seemed really complicated to me when I was younger and I realize now that it’s because of the meat component. You need to boil the oxtail. Sometimes, you need to boil it forever or use a pressure cooker, otherwise it won’t get tender and it’s just nasty. You need to skim out the garbage that shows up when you boil meat. And it takes a long time! For vegan kare kare, you’re looking at maybe 15 minutes of prep time and 15 minutes of cook time. Rinse and chop up all your veggies. for the jackfruit, I cut the chunks that came out of the can in half or in thirds, depending on how big they were. I made them about the same size as the eggplant pieces. Heat up the pan and saute the onion and garlic in oil. When it gets fragrant, add the jackfruit, eggplant, and 1 cup of water. Mix it a bit, cover, and let it cook for about 5 minutes. 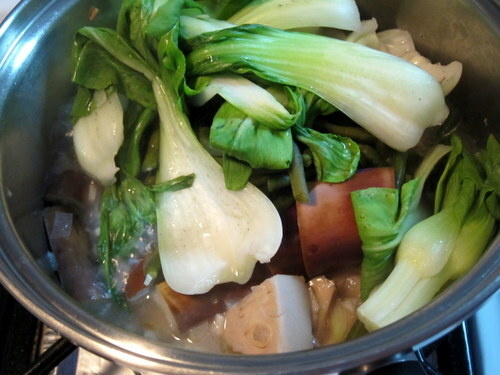 Add the sitaw/beans and bok choy, cover, and let it all cook for another 3-5 minutes. Isn’t it pretty? The thing in the bottom middle is a piece of jackfruit. When the veggies are just about cooked, stir things up a bit, being careful not to mash up any of the veggies. Then, make a well in the center of the pot and put in the peanut butter. The PB should melt completely. Add salt to taste. Add achiote if you want. It will give the dish a more reddish color. I didn’t add it this time around. 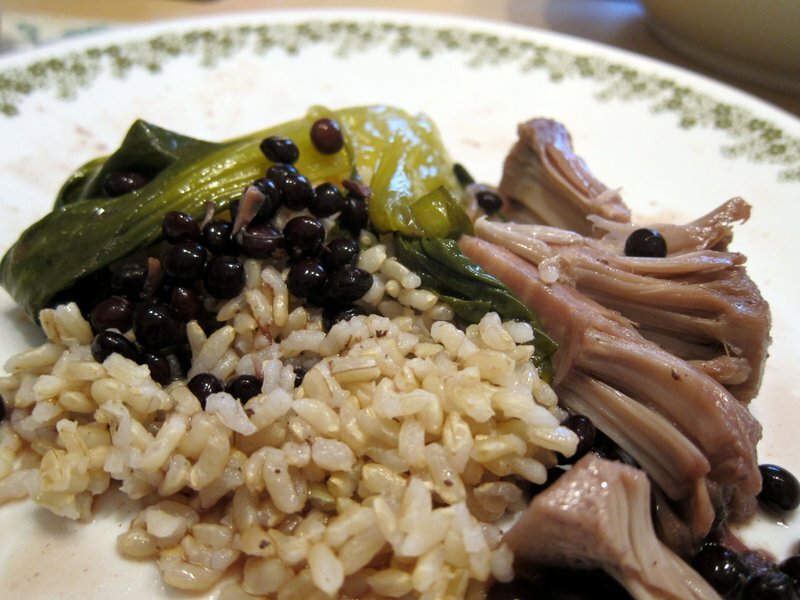 Serve with white rice and bagoong (not vegan!) or a bagoong substitute. If you have the green-floral-border Corelle plates that every Filipino-American seems to have, use that for sentimental value. Follow it up with some halo halo with sweet jackfruit if you can. I’m so hungry now. Full disclosure: My dinner wasn’t totally vegan because it was cooked with pork, which I did not eat. I could not resist being a vegetarian for one meal because this is one of my favorite dishes that I don’t often get to have (maraming salamat to my Aunt who brought it over). I’m extra excited because it’s a dish that can easily be veganized simply by not cooking it with meat. What’s great about this dish is that the meat is almost an accessory. This is in comparison to other Filipino dishes where meat takes center stage and the veggies are for decoration. The flavor and color comes in large part from the kadios, which is the real star of the dish. This is a definite notch above the canned ripe jackfruit that I’m used to. Hmm… if only I could travel to a place where I can get fresh jackfruit… I will say that jackfruit is not for everyone. When I was little, the smell was a turnoff. It still is a bit of a turnoff, but the taste of the fruit more than makes up for it. Take this with a grain of salt; no one else I know has an issue with how jackfruit smells.